Exontrol - Building EBN files. The EBN file provides skin capabilities for almost all of our UI components. 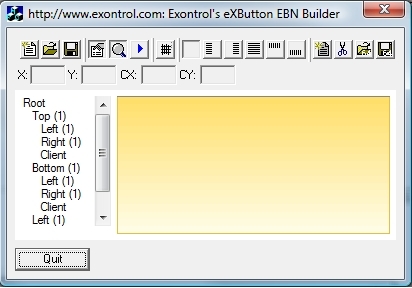 The Exontrol's eXButton/COM installs a WYSWYG Builder ( Builder.exe ) that helps creating and editing EBN files. The skin method, in it's simplest form, uses a single graphic file assigned to the client area of the painting object. By using a collection of objects laid over the graphic, it is possible to define which sections of the graphic will be used as borders, corners and other possible elements, fixing them to their proper position regardless of the size of the painting object. 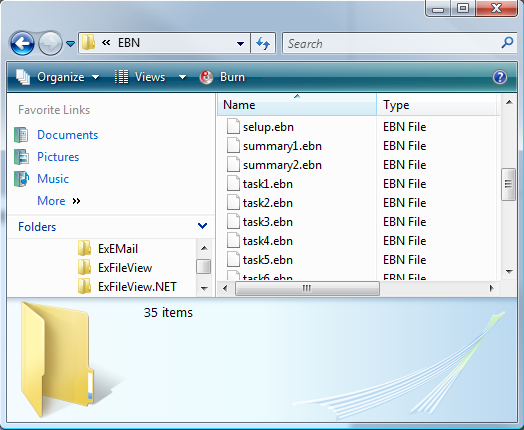 The skin file ( EBN ) is organized as a hierarchical list of objects. Each object can display a portion of picture with attributes like tile, stretch or transparent or a background color. The position for each child object is relative to its parent, and can be aligned to any side of the parent's client area. 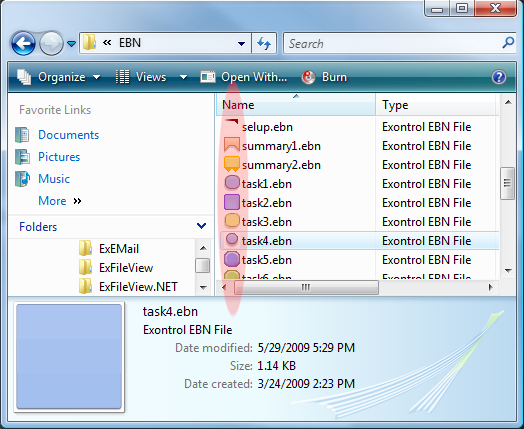 Create the EBN file from a screen shot. Create a complex EBN file within a minute. Rendering the EBN objects in the component. Using the Exontrol's ExPropertiesList to browse EBN objects. What's the difference between stretching a picture and EBN technology? The main difference is that they doesn't look the same when the picture or the EBN is stretching or applied to the same object. Also, simple stretching a picture won't hide transparent points or create not rectangular regions. Here's illustrated the difference between stretching a picture and using the EBN file with the same bitmap as . If we stretch the picture we get and we get if the EBN file is applied to the same object. The eXButton/COM installs the WYSWYG Builder to create, view or edit EBN files. 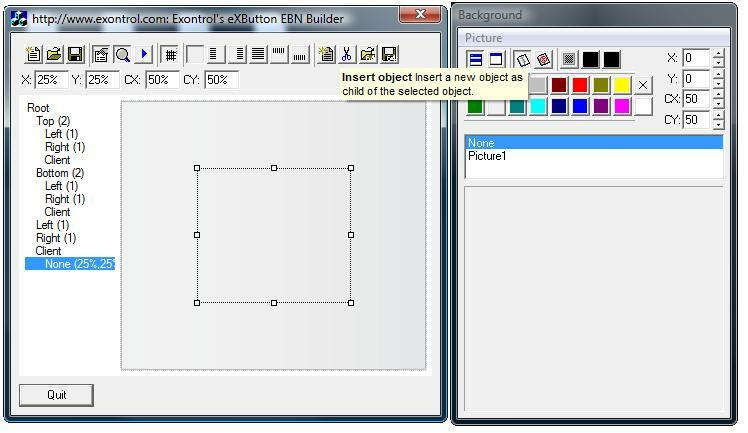 The eXButton/NET configuration does not install the EBN's builder. Please go to eXButton's download page here, and download and install the COM/ActiveX version or you can download it directly here. 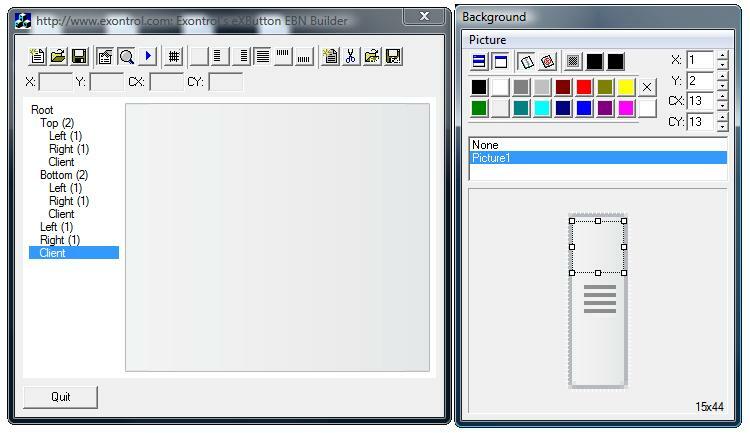 Once you install the eXButton/COM setup, it provides the EBN's builder, as well as a Windows Shell Extension that allows viewing the EBN files in your Windows Explorer as you would see the BMP or picture files in the thumbnail view. Also, you can view the EBN content by dragging the file from your Windows Explorer on the Exontrol's eXImages tool that can be found here. while the next screen shot shows the Windows Explorer after installing the eXButton/COM ( you can see the visual appearance for each EBN file ). 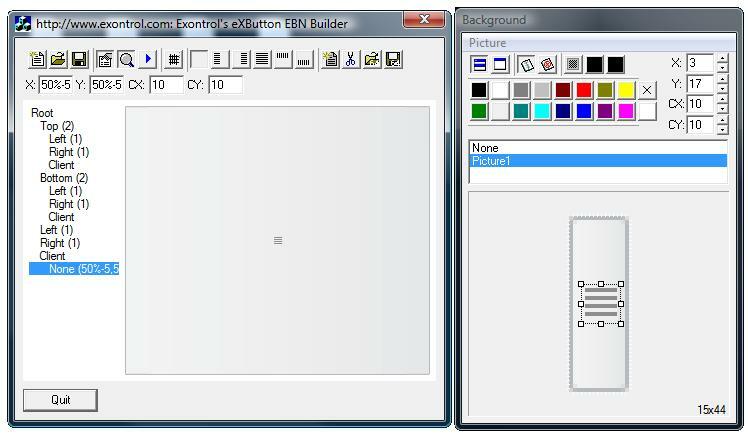 Currently, the EBN builder may show one or more panels, such as Designer, Background, Zoom and Test. 2. 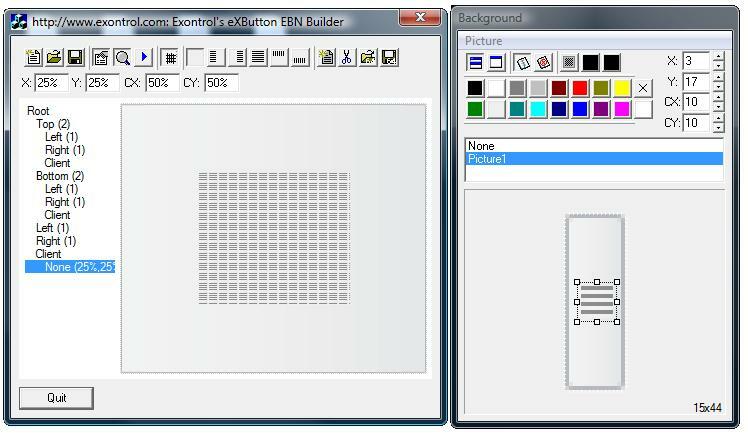 The second step is running the exbutton's builder (usually it goes to "C:\Program Files\Exontrol\ExButton\Builder.exe" ) so we can take the essential picture and use in creating our new EBN. 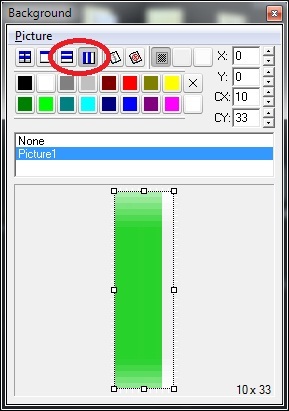 In MS Paint selects the essential (or part of the) picture and press the CTRL + C so you put it in the clipboard. All you need to do now is to press the Save or Save64 ( Generates the Base64 string ) to save or create the BASE64 code to be used in the following code. Here's the result saved as excel.ebn. Here's the step-by-step guide to follow in order to create a complex EBN file. 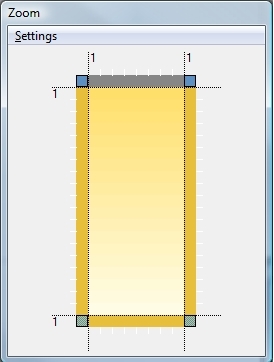 If we follow the steps for creating a simple EBN file, the image inside the thumb gets stretched and does not look nice when the vertical scroll bars is resized. In order to prevent this, we need to change the EBN file by inserting a new object that will display the fixed part only, and being in the center all the time. So, here's the steps. The first 2 are the same as you would create a simple EBN. 4. Adds a new object in the Client area that will show the picture on the thumb. 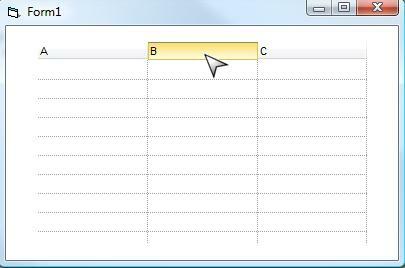 Locate and Run the Builder.exe ( designer ) tool in the ExButton's installation folder. ( Usually it is located C:\Program Files\Exontrol\ExButton\Sample\VC\Builder\Builder.exe ). Insert your picture using the Zoom\Settings\Load Picture open dialog, or drag the picture file from your Windows Explorer to the Builder tool. 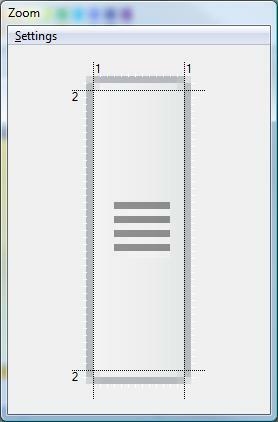 If necessary, change the size for the margins in the Zoom window. Insert your screen shot using the Zoom\Settings\Load Picture From Clipboard. If there is not screenshot in your clipboard, a warning message is shown. If your clipboard contains a screenshot, the Builder tool displays a window called Select Picture, that helps you to select the entire picture or a portion of it. Use the mouse and arrow keys to adjust the portion of the picture you need to insert to your skin file. 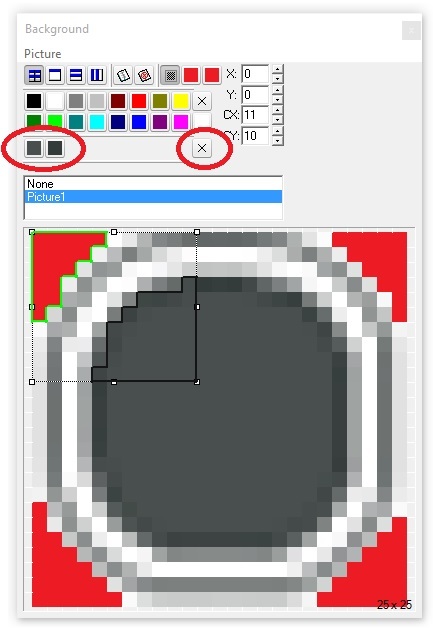 If necessary, change the points to specify the transparent colors, in the Zoom window. By default, the Zoom\Settings\Load Picture or Zoom\Settings\Load Picture From Clipboard inserts a picture, assigns borders of 4 pixels wide to the skin, and the corner pixels as being transparent color for corners. Let's say that we want to create an EBN file that looks like this: , so we need to start from a BMP picture that shows like this: , as you can see the corners are red. Load the picture file using the Zoom\Settings\Load Picture, and so the builder applies the picture to the skin. The first screen shot shows the Zoom window after loading the picture file. 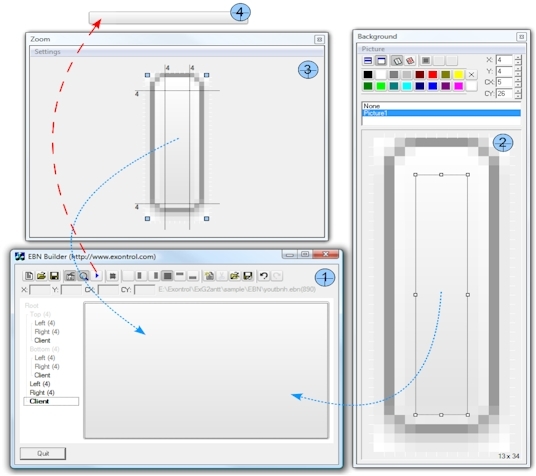 The second screen shot shows the designer of the Builder tool. so the round corner is showing back. 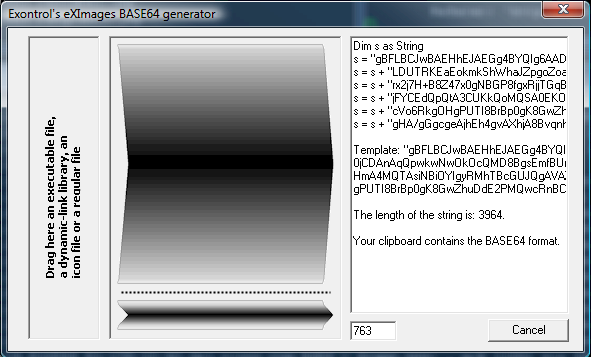 The BASE64 encoded strings hold objects such as icons, images, pictures, or EBN files. In some cases, in order to avoid carrying the files with your setup you can use the BASE64 encoded strings to hard code the object. The Exontrol's eXImages tool can be used to encode files or decode BASE 64 strings. Use BMP files as much as possible, because they show an accurate picture when zooming ( not compressed like GIF ot JPG ). Always check the EBN file size. Use small picture files, not huge, so loading and displaying your EBN could be time consuming. By default, the EBN file is compressed, so even if you load a BMP, the EBN is compressed! Even in the case we presented we can reduce the size of the picture from , to , and so we still keep the essential parts of the skin. In the first case, the EBN file's size is 1,722 bytes, where the second is 515 bytes, which is better and they display the same skin. For parts of the skins, that just don't need to screech a picture, just assign a background color for the part if required. When no needed, avoid using transparency, so it will avoid creating regions, and so EBN file could be faster. You can save the EBN file as uncompressed, clicking the Save button while CTRL key is pressed. Don't add multiple pictures, if you don't need them. Don't add new objects that you are not planning to use them. The "Change the size of apps on the screen" on System setting changes the apps DPI (Dots Per Inch) settings. Based on these settings, the applications that are not DPI-aware but are running on a high-DPI display setting can suffer from many visual artifacts, including incorrect scaling of UI elements, clipped text, and blurry images. The EBN 1004 introduces, the number D, which indicates the value of the number based on the current DPI. For instance, "4" indicates a 4-pixels, while "4D" indicates a 4 dots, or in pixels, is 4 * current DPI settings. So, on a DPI 100%, "4D" indicates a 4-pixels, while on a DPI 150% "4D" indicates a 6-pixels ( 4 * 150 / 100 = 6 ). 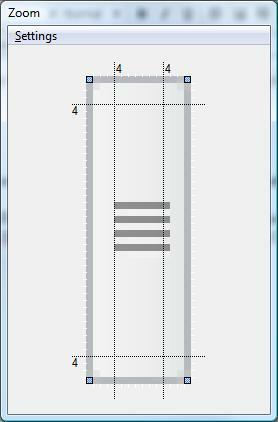 Any part that EBN displays has left/top and width/height coordinates, to identify the position / size to be shown relative to its parent. In other words, "top[4,back=RGB(0,0,255)]", draws a blue line on the top side of the object's background, of 4-pixels wide, no matter of DPI scaling, while "top[4D,back=RGB(0,0,255)]", draws the line of 4-pixels wide if DPI scaling is 100%, or 6-pixels wide if DPI scaling is 150%. The Colorable Region defines a portion of the EBN object where the EBN color is applied. The Colorable Region is defined by all points of the EBN object that are between Start and End color. Any object in the EBN, can be colorable or not-colorable, which means that the EBN color is applied or not to this region part when the color is applied to the entire EBN object. For instance, at runtime the identifier 0x1FF0000 applies blue color to all colorable parts that compose the EBN object, excluding the not-colorable objects. In other words, if your EBN shows borders, margins, shadows, ... you can specify them to keep their color when a solid color is applied to the entire EBN object. 1. 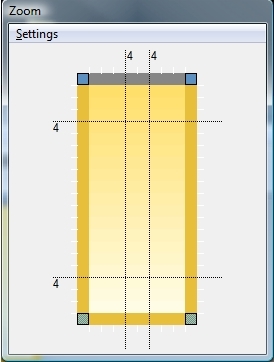 Horizontal/Vertical stretching, stretches horizontally/vertically the picture on the object's background, and tiles vertically/horizontally the rest. Currently, the EBN 1002 supports tile, stretch, horizontal stretch and vertical stretch. 2. 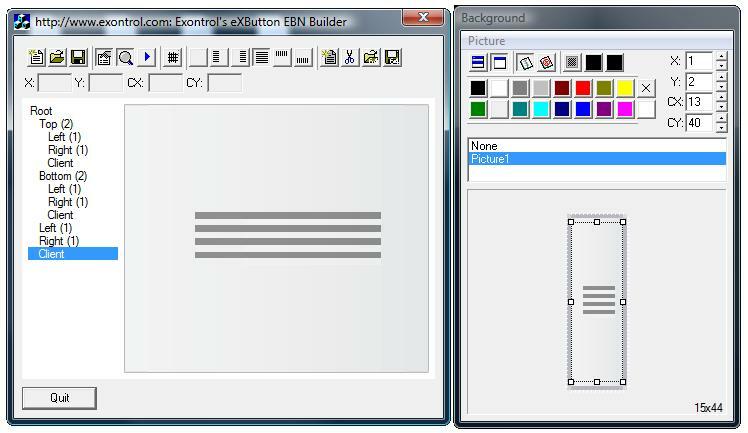 Colorable, Not-Colorable support, Any object in the EBN, can be colorable or not-colorable, which means that the EBN color is applied or not to this part when the color is applied to the entire EBN object. For instance, at runtime the identifier 0x1FF0000 applies blue color to all parts that compose the EBN object, excluding the not-colorable objects. In other words, if your EBN shows borders, margins, shadows, ... you can specify them to keep their color when a solid color is applied to the entire EBN object. The following table shows EBN object with not-colorable parts ( borders and shadow ), and EBN object with all-colorable parts with different colors applied. Click any of the following screen shot/picture, and copy/save the TXT file associated. The TXT file is a template (x-script) file that can be applied to any of our UI components. 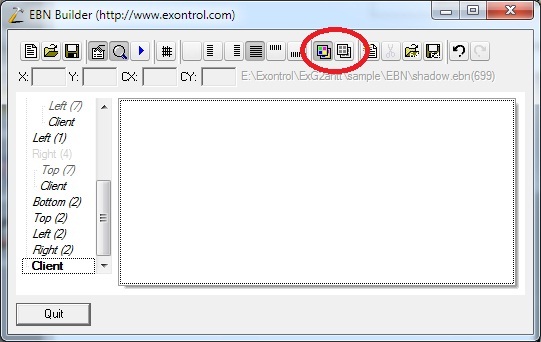 Open the Exontrol's eXHelper tool for the component, and paste the TXT content in the middle panel. Press the CTRL+S to see the result. Right-Click the middle panel, and select the "Convert To ..." item to get the x-script template saved to your programming language such as VB/NET, C#, Delphi and so on. Click the control in design mode, locate the Properties item, locate the Template page, and paste the TXT content in the right panel. Each line in VisualAppearance context indicates an EBN file compressed and saved as BASE64 encoded strings. Most UI parts of our UI components can show any EBN content, so you can combine in any way the following templates.